Once we have vacuumed your carpet and baseboard crevices, we will pre-treat your carpet and then steam clean the entire carpet using our truck-mounted cleaning systems. Our van mounted equipment provides excellent deep steam cleaning which will clean your carpet and leave it free of any residue, as well as, a powerful vacuum that leaves minimal moisture in your carpet. But we are not done yet! 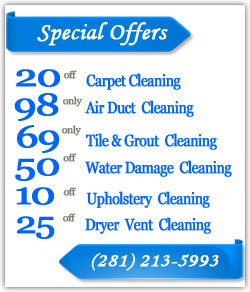 Hiring Stafford, TX carpet cleaners is a smart decision. If you are tired of seeing stains and spots of all kinds, come to double a Carpet & Upholstery Cleaning for assistance. Our professionals are properly trained and will give you the quick response you deserve when you contact our Stafford office. No matter the size or age of your home, you have a right to clean carpets, and our staff can help you achieve this outcome. Whether you are preparing your home for a special event and want it to look its best or you are just eager to feel proud of the way that your floors look.